How good is your vocabulary? 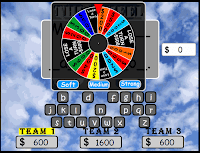 Time to play some group games of Wheel of Fortune. First, it's boys vs girls. Then, it' time for you to challenge a partner.